Shoes! That’s right, kids! SHOES! Giraffe print ballet flats. Now, whenever I hang out with giraffes, I’m that much harder to spot. White winkle pickers with a kitten heel. I haven’t worn these yet, but what a hoot! Thrift store find. Snakeprint slingbacks. Also found at a thrift store. Raspberry T-strap peep toes. Well, they’re black with a metallic raspberry halftone print on them. 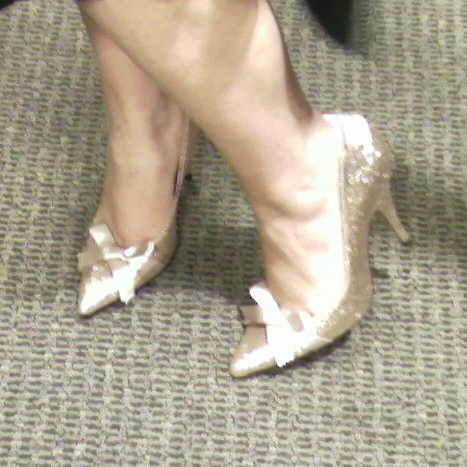 Scored from the 80% off rack at DSW, they go perfectly with a vintage-look raspberry satin bias-cut dress I have. I ordered a pair of lucite wedges that were just a little too small, and Nova ordered these, which turned out to be a lot too large. We traded. They’re too big, even on me. Wacky sizing. Summery white-and-linen(ish) cork wedges. Thrown in as a bonus during the lucite shoe trade mentioned above. The white has a slight snakeskin print, and the linen color is actually faux suede. I’ve worn these shoes three or four times, and just about worn them out! The heels are starting to compress, and the buckle on one shoe is almost completely torn out. They’re not quality, but they are comfortable. Red patent ankle-strap peep toes. I bought these specifically to go with a BRIGHT RED belt, which I wound up giving to my friend Megan. Yes, I have other red shoes, but they’re all a darker red. The clashing, it was no good. My Ballpark Frank-size ankles means that I have to wear these on the loosest setting, and you can see how snug that ankle strap still is. So, not appropriate for the office, not good for walking around anywhere. I don’t know what to do with them, but aren’t they fun? This pair of Pedro García “Noa” pumps isn’t in my collection. I tried them on at Nieman Marcus, where they were on sale for close to $200. Homey don’t play that. Actually, quite a steal as they list for closer to $400. (Insert heart attack here.) I apologize for the quality of the photo, but it was taken with my cell phone and I just couldn’t keep still in these shoes!